Hey everyone! Today I’m sharing with you our Chicco MyFit LE Harness + Booster for Asher! ready to bump up from a convertible car seat… this post is for you! each other…get the full scoop… and help each other make sure our little ones are safe. I wanted to share the basics about this seat and the features that make it so amazing! We have five kids and a larger vehicle. But with so many kids, that car fills up quickly! So that’s why I love how the MyFit LE is a great fit for smaller vehicles. Doesn’t take up much space and has a great slim fit! Car Seats and a full line of playards, highchairs, car seats, strollers and more. Couple key facts about the My Fit LE. This seat converts from 5-point harness to a belt-positioning booster. You start out with the harness and then transition to a booster later down the road. In harness mode it goes to 25-65 pounds. In booster mode it’s for 40-100 pounds. The harness has a 54-inch height limit. above your child’s shoulders, to accommodate years of growing. One less “his elbow is touching my elbow!” please. transition them to the booster and seatbelt mode.. You’re ready to roll! plays a critical role in knowing when to transition from the 5-point harness to belt-positioning booster. their seat belt and accidentally shifting it into an unsafe position. I love that this seat does both because when you are looking to purchase a seat for your child..
You want to know how it’s going to work down the road. You want it to make sense for your budget and your child! There is also a basic MyFit that has similar comfort and safety features but is available at a lower price. So you have two great options to choose from! it with smart functionality that makes it the easiest to install simply, accurately, and securely, every time. That is a huge deal for us moms – we want to make sure it’s in correctly and securely! bubble levels to help you have the correct angle in the vehicle seat. fit with LATCH or the vehicle seat belt. 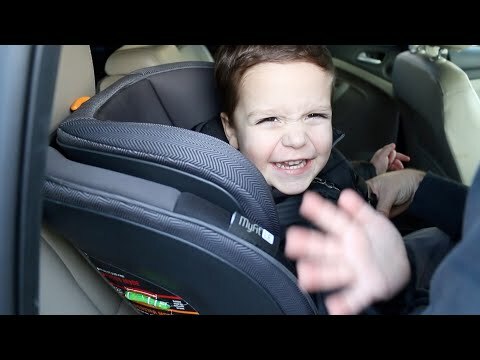 SO just a recap – The MyFit LE is a harness to booster car seat. rear-facing for as long as possible so wait until your child outgrows their convertible car seat to make the switch. Thank you Chicco for sponsoring today’s post! I hope you found the video helpful as you check out the details of this seat! Sophia said she wants it in her size. I don’t blame her.